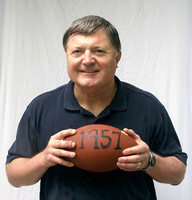 A graduate member of the Tomahawk High School Class of 1957, participating in football for four years, basketball for three years, track for one year, and baseball for one year before serving as baseball manager his senior year. Lloyd earned three major letters and one minor letter in football, one major letter and two minor letters in basketball, one major letter in track, and one minor letter in baseball. Lloyd was captain of the football team his junior year and co-captain his senior year. All Conference honors included being selected as All Conference on both offensive and defensive tackle his junior and senior years. Lloyd was also selected as All State Honorable Mention in football his senior year. He was the second individual to do so in football at Tomahawk High School. Lloyd was All Conference Honorable Mention in track for his efforts in the shot put and relay. In addition to playing nine sports seasons, Lloyd served as president of the Lettermen’s Club his senior year. Lloyd continued his athletic career at UW-Madison where he played football on a full athletic scholarship. He graduated with honors from UW-Madison in 1962. Lloyd earned a Bachelor of Science Journalism Degree and because of his hard work was selected as “Outstanding Advertising Graduate”. After college, Lloyd entered the United States Army where he served as an officer until 1965. Lloyd’s business history includes: Vice President, Account Supervisor with BBDO Inc., New York from 1976-1980, Director of Marketing with Snowmass Resort Association, Snowmass Village, CO from 1980-1986, and owner of Bishop & Bishop Marketing Communications in Aspen, CO and Monroe, WI from 1986-2000. Now retired, Lloyd is living in Madison, WI with his wife of 44 years, “Saint” Carolyn, where he is pursuing freelance writing projects.